Where on google-earth might Kaidie be? 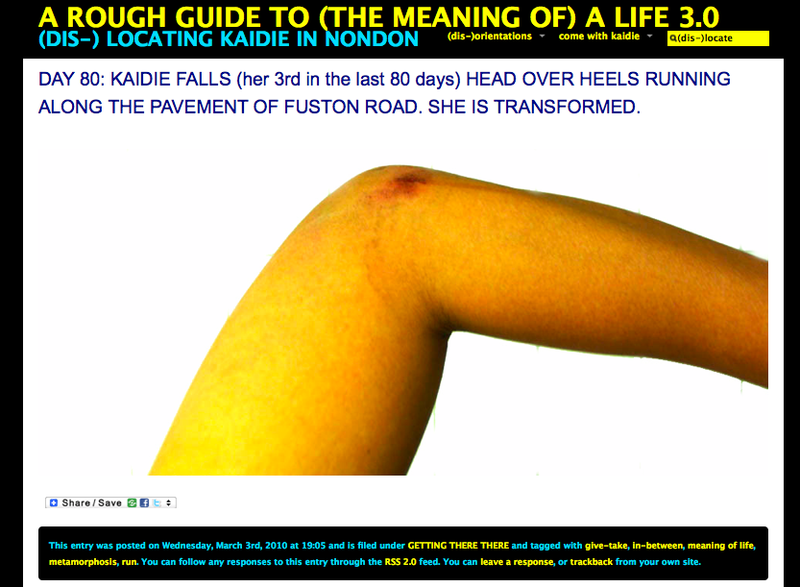 2 days ago Kaidie reported that she ‘fell head over heals at Fuston Road’ and that it ‘transformed’ her. She shared some image of some dislocated part of her body with some injury of some sorts. We – by that I mean you and I – have not heard from her since. I have had to hack into her site and ask you: would you know where Kaidie might be? Have you seen Kaidie in Nondon? This entry was posted on Friday, March 5th, 2010 at 02:30	and is filed under REALITY CHECK and tagged with chaosmos. You can follow any responses to this entry through the RSS 2.0 feed. You can leave a response, or trackback from your own site. Aha! Spotted you at the tate this evening, i think! Blast theory booths playing ‘can you see me now’ – was you, wasnt it? did you see me? Was standing with friends.